The Swartdogs, Team 525, earned 15th place in the regional FIRST (For Inspiration and Recognition of Science and Technology) robotics competition in Kansas City last weekend. The team was eliminated in the semi-finals but will have another chance to advance to the national competition at the 10,000 Lakes Regional. Led by physics teacher Kenton Swartley, the team built a robot to perform different tasks, competing in two minute 15 second matches. 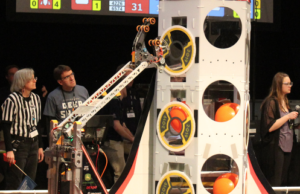 This year the game was Rebound Rumble, in which the team’s robot picked up basketballs and shot them into four different hoops. In the middle of the field were three different bridges that the robots had to balance on. 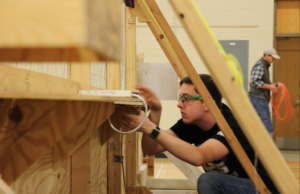 Though the team did not advance to nationals in this competition, they felt the process was still equally rewarding. The team received the Gracious Professionalism award, an honor awarded to teams that exhibit outstanding sportsmanship. “It’s nice that other people are noticing what we’re doing to help other teams,” Yang said. The 10,000 Lakes Regional will be held in Minneapolis on March 31.